This is a summary for Brinley from 22-22.5 months old. Sleep is going well! Nothing new or different. Eating is also going well. She is sometimes having meals where she doesn’t eat much, which is new for her. It might be concerning to me if she were my oldest child (it did with Brayden). She is my fourth and I know it is totally normal. Just know that at times, your toddler will eat next to nothing and will still survive. Don’t stress–your child will eat at the next meal. Playing is going well. She is loving having her siblings home for summer. “Bay-den,” “Kay-kay or kay-lyn,” and “Kenna” are all very fun playmates for her and she is so happy to have them around all of the time. Her eczema spot has almost gone completely away a few times. I clipped her fingernails rather short and it got better then. I noticed she will scratch it, and I vaguely remember when McKenna had eczema reading that scratching it makes it worse. So I am keeping her trimmed to prevent the ability to really scratch. This spot gets much worse when the buggers are over it. She wipes her buggers over that spot every time if I don’t catch it with a tissue first. She has had a runny nose for months with these teeth coming in. Speaking of, two more of her canines came through over these last two weeks. Just one more to go! And the buggers are going away! We had her biggest tantrum during this two week period. Overall, she was quite pleasant and great. One night, I was picking things up. She loves shoes and is often getting my shoes out to put on herself. I had cleaned up my shoes when she got a pair out. I kept cleaning other things and her attention left the shoes. I asked her to put my shoes away. Typically, she is a very enthusiastic cleaner. This time, she said, “No!” and slapped them out of my hands. I firmly told her, “Brinley, put mommy’s shoes where they go. Say Yes Mommy.” She got upset and refused. I took her to her booster chair at the kitchen table, buckled her in, and set the timer for two minutes. I told her she was having a time out and left the room. She was very upset. By the end of the two minutes, she had calmed down. I went to her and said, “Brinley, you had a time out because you did not obey mommy.” I then took her to my room, pointed to the shoes on the floor, and said, “Put the shoes away please.” She said, “Kay!” and put them away. I thanked and praised her for obeying me. Summer is in full swing and so are the disruptions. The three older kids are playing softball/baseball and we have games several nights a week. Brinley often gets to bed late. I have planned other activities so she rarely has a nap disruption. We went to an amusement park (Lagoon) during this time. She is too small for most rides, but she loved even just being there. She loved watching the roller coasters and she would scream when the riders would scream. 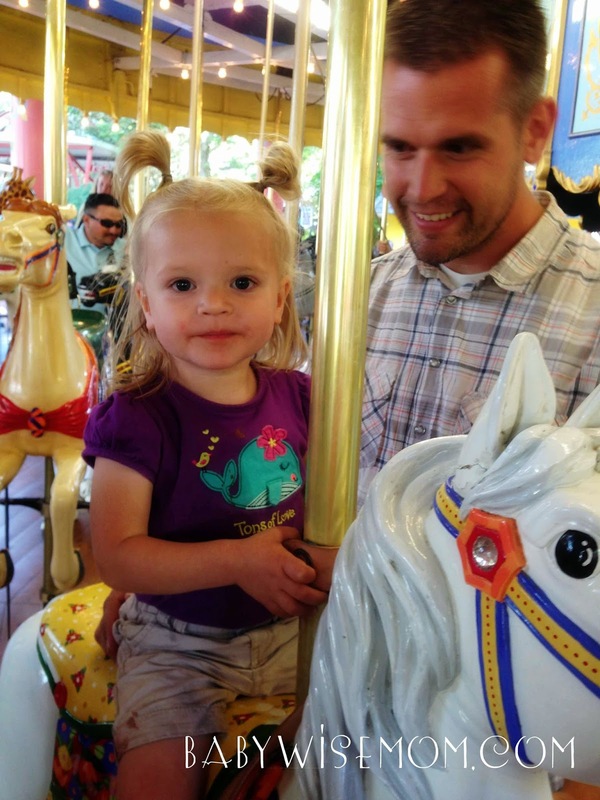 She rode the carousel and actually got a bit nervous at first, but she quickly got over it. She missed her nap that day but was very pleasant. On the drive home, she did not fall asleep. McKenna did, however, much to the concern of Brinley who yelled, “Kenna!” for most of the drive. McKenna is a deep sleeper and slept through it, though.